Our congratulations from all here at downthetubes go out to artist Graeme Neil Reid and his wife Catriona on the arrival of their new baby girl, Lucy Anne, born on Thursday 8 April and weighing in at 8lbs 1oz. After two potential Commando readers, the Reid family now has a potential Manga reader. 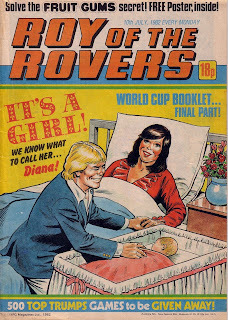 With dad a football fan, our Roy Of The Rovers cover couldn't be more appropriate and this was one result that definitely went into extra time as she kept everyone waiting by being a nerve racking 10 days overdue. However we are pleased to report that mother and daughter are both healthy and happy and now home which means that her dad might actually get to see the second episode of Doctor Who on Saturday night. From the four babies we have reported on in the last couple of years, Zoe, Arianna, Sasha and now Lucy, it rather looks like Manga is set to take over the world. With the 60th anniversary of Eagle fast approaching (14th April 2010) now seemed like a good time to have a look at what that iconic front page of Eagle magazine might have ended up looking like. Shown here are two of the dummies that Eagle's founders, Frank Hampson and Marcus Morris, put together to sell the idea of Eagle to a sceptical publishing world (Click the covers for larger images). Both images shown space hero Dan Dare prominently (albeit in purple, so the strip doesn't quite yet have that 'RAF in Space' vibe) and have strips that would make it into the first issue of Eagle (The Great Adventurer and Rob Conway - as Secret City was renamed). Who can say what became of Ernie and Joe of Strawberry Farm, apart from the fact that they were never seen again. As the launch date got closer, so further issues had to be mocked up to show what the magazine would look like. The image here shows what a transformation has taken place since the initial dummy magazines were put together. This is much closer to what the eventual second issue would look like but there were still a number of alterations to be made. Space Fleet are all still decked out in gorgeous purple rather than RAF green, the Eagle bird has yet to make it onto the front cover, the famous Eagle font has yet to be designed by Ruari McLean and the Dan Dare logo is not quite ready. Production work continued as the launch date got ever closer until the first issue of Eagle was deemed ready to show the world. To publicise the title the publishers, Hulton Press, produced this final draft version. It was in full colour but was only eight pages long (eight black and white pages would be added to the actual first issue), was dated 21st April 1950 (so as not to give the actual launch date away) and is missing that iconic "Dan Dare, pilot of the future" masthead in the first frame. In the next part of this celebration of Eagle at 60 we'll look and see what was actually in the first issue of Eagle. Elephantmen, the creation of former Marvel UK Managing Editor Richard Starkings and Chief Tiger of Comicraft and publishing house Active Images, has been optioned as a movie. Comic Book Resources reports that Richard announced that his creator-owned series Elephantmen has been optioned to be “a major motion picture,” over the weekend at WonderCon, San Francisco. He added that directors and actors are currently being approached. Originally created by Starkings as a spinoff from another of his comics, Hip Flask, Elephantmen takes place in a dystopian future in which human/animal hybrids struggle to integrate into society after being rescued from a brutal life as mindless, corporate soldiers. Artists on the title include the brilliant Boo Cook, Moritat and Ladronn. The series will reach issue Issue 25 later this month and the anniversary issue features 25 pages each drawn by a different artist. Among those recruited are Tim Sale, Dave Gibbons, Ian Churchill, Whilce Portacio, Paul Grist and Dougie Braithwaite. Reflecting Richard's love of British comics, the title has featured plenty of back up articles on British comics in its pages. Richard's latest success getting his creation optioned is well deserved, considering his lifelong dedication to comics and comic creation. He pushed Marvel UK toward experimenting with US-sized comics such as Dragon's Claws and Death's Head back in the 1980s, along with masterminding the creation of hugely successful weekly comics for the comic such as The Real Ghostbusters which helped launch the comics careers of a number of British writers and artists, including Dan Abnett, John Freeman (who? ), John Carnell, Andy Lanning and many others. Richard, who founded lettering company Comicraft in 1992, counts font design, comic book lettering, editing and writing among his many talents and was of course one of the early pioneers of computer-based comic book lettering. Active Images began in 1995 and began publishing comics - including Hip Flask - in 2002. His Balloon Tales web site is an invaluable resource for new letterers. The latest issue of Eagle Times (Volume 23 No 1) is now available from the Eagle Society and, naturally enough, is an issue dedicated to the impending 60th anniversary of The Eagle on 14th April. The issue includes an examination of the career of Sergeant Bruce, whose single-episode exploits ran for nearly four years in the 1960s Eagle, firstly as 'Sergeant Bruce, C.I.D.' and then in 'Can You Catch a Crook? '; a tribute to Geoffrey Bond (1920-2009), best known as the writer of 'Luck of the Legion' and who wrote the 'Justin Tyme' strip for Eagle Times; reminiscences of some of Ron Embleton's 'discarded' artwork; and a look at the life and career of Paul Trevillion, better known for his sports illustrations and his work on 'Roy of the Rovers' for Tiger, who drew some of the 'Can You Catch a Crook?' and 'U.F.O. Agent' strips in the 1960s Eagle. Of particular interest to downthetubes fans, will be our very own Jeremy Briggs' feature on Jim Stalwart, Dan Dare artist Bruce Cornwell's 'forgotten' Space Captain, whose exploits graced the pages of the Junior Mirror in 1954. Also featured is a revisit to the Eagle connections with Ladybird Books, including some examples of the work of Roy Worvill (writer) and covers by the artists Robert Ayton, Frank Hampson, Frank Humphris and Martin Aitchison, including a Humphris 'Ladybird' Rough, showing the sketch which led to one of the full-page illustrations in the Ladybird book. The latest issue of DC Thomson's Classics from the Comics went on sale a few days back, but we're still playing holiday catch up so this is the first opportunity we've had to give it a plug. The 68-page retro monthly comes crammed with comic classics from days gone by, including a special feature on 1957. Featured this issue are plenty of humour strips from The Beano, Beezer, Topper and Dandy such as Dennis the Menace and, as usual, an adventure strip - this time, it's an example of General Jumbo, a character that used robot toys to fight bad guys. 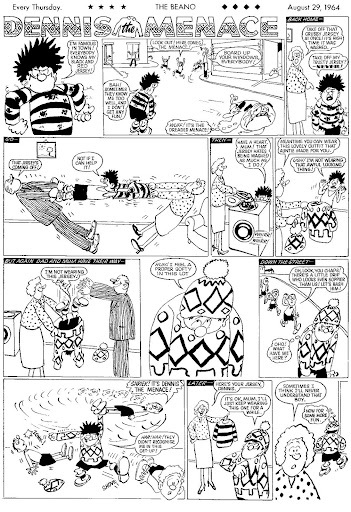 Other strips in the issue include Bully Beef and Chips, Pup Parade, The Numskulls, Baby-face Finlayson, Bananaman, The Banana Bunch, The Three Bears, Hungry Horace, The Bash Street Kids, Biffo the Bear, The Truth About Wilson (another adventure strip), Greedy Pigg, Little Plum and the original Brassneck. The issue also includes a competition to win classic audio books. If you want a trip down memory lane, get this month’s Classics. • Click the images above to view sample strips from the issue, courtesy of DC Thomson. A new Comics Festival at the University of Hertfordshire later this month will be celebrating some of the best of British comics, with a great line up of events that include appearances by the likes of Dave Gibbons, Pat Mills, Kevin O’Neill and Gary Erskine. UniComics will be held at the De Havilland campus of the University of Hertfordshire, located at Hatfield, just 20 miles from London. Billed as a truly accessible event, it aims to celebrate the varied art forms within and inspired by Comics and Graphic Novels. With the comics medium now showcasing a vast degree of diversity, appealing to all ages and habitually displaying truly literary qualities, co-organiser and co-founder Danny Graydon, a film and comics journalist, says UniComics offers an ideal opportunity to be informed, inspired and invigorated by this unique art form. Over a four day period, UniComics features a varied programme of ticketed and non-ticketed events suitable for just about everyone. Attendees will be able to enjoy a selection of author/illustrator lectures, schools and family events, film presentations and screenings, open mic sessions, theatre performances, art workshops and panel discussions. “Obviously, the name immediately highlights the fact that we’re hosted by a university, but, equally, it’s to stress the sheer universality of the Comics medium," says Danny Graydon of the festival's name. "Right from the start, our missionwas to ensure that UniComics would be a celebration of all kinds of Comics for all kinds of people. For UniComics’ inaugural edition, the event flies the home flag as three veritable comics superstars – writer Pat Mills and artists Dave Gibbons and Kevin O’Neill – reminisce about their early careers on seminal British comic 2000AD, while Mills joins ILEX Books Managing Editor editor Nick Jones, academic Will Brooker and artist Gary Erskine to look back to the 1950’s and celebrate the 60th anniversary of a similarly iconic presence in British Comics history, The Eagle. There's a packed schedule for the Festival. You can be mystified by The Paper Cinema’s live music and illustrative puppetry performance, while budding comics creators can be thoroughly inspired with workshops conducted by such vivid talents as Dave Gibbons, Ian Culbard, Marcia Williams and Sarah McIntyre, and families can craft their own personal comics with our family diary comics workshop presented by Laydeez do Comics. Further inspiration - and networking! - is on hand at ComixBox, an open-mic style evening where a great line-up of artists are on the clock to show off their wares! There’s screen fun, too, as kids can enjoy the action-packed adventure of our Ben 10 animated film screening and adults can immerse themselves in the Director’s Cut of Watchmen, based on the celebrated and award-winning graphic novel by Alan Moore and Dave Gibbons. Last, but not least, save some energy – and cash – for the UniCon comic convention, offering a stunning array of comics and related merchandise to start or expand collections, publisher stalls, panels as well as signings from noted creators. Treating the medium with maximum respect and enthusiasm, UniComics will provide audiences with a vibrant showcase of Comics, from small press to the largest mainstream publishers, inviting newcomers to take their first plunge in to an exciting and captivating art form while providing an ample reminder to long-time fans as to why comics maintain their unique power to enthral, entertain and inform. The UniComics Festival is presented by University of Hertfordshire in collaboration with Danny Graydon Film & Comics Journalism, Laydeez do Comics, Herts County Council (Libraries), the St Albans Children’s Book Group and the Film Education Consortium. Since its launch in 1977, 2000AD – “The Galaxy’s Greatest Comic” - has been at the forefront of British Comics and remains a shining light in an increasingly barren landscape. Arriving perfectly in time with the popular re-emergence of Science Fiction and bearing a punky, anti-authoritative tone, 2000AD thoroughly invigorated boys comics, introducing a collection of classic characters. For a vast array of 2000AD’s artists and writers, the comic was vital springboard to international recognition and success. On 14th April 1950, a new boys comic, The Eagle, vigorously introduced some wonder in to the drudgery of post-war Britain, and, with its star strip Dan Dare: Pilot of The Future, showcased a profoundly alluring fantasy of a strong and vital Britain in then far-flung 1997 that boldly led the way in the exploration of outer space. 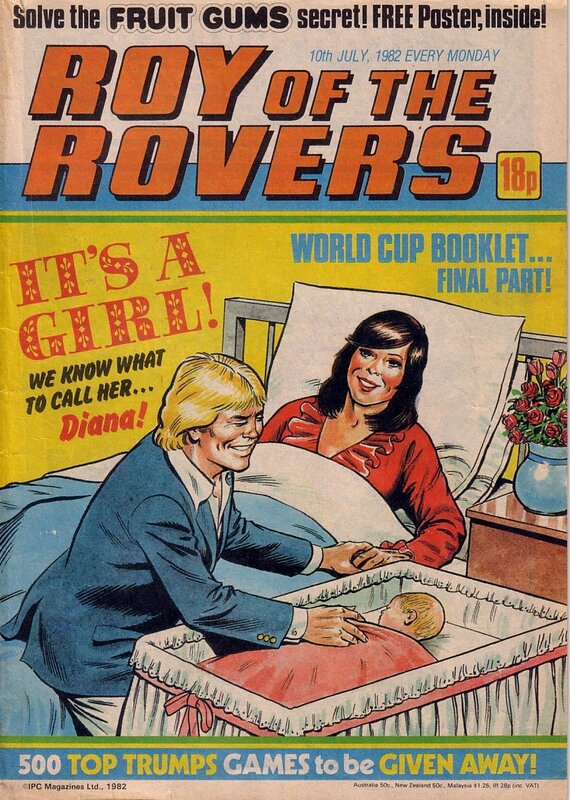 One of the most successful comics in British history, at its height, The Eagle remarkably sold just under a million copies a week. In an alternate 1985 where superheroes exist – and are outlawed - the world stands on the very brink of nuclear conflict. When a former colleague is murdered, an active vigilante named Rorschach begins a sprawling investigation which soon uncovers a threat that could completely change the course of history. Long deemed “unfilmable” – notably by Watchmen writer Alan Moore himself - 300 Director Zack Snyder’s adaptation of Moore’s and Dave Gibbons’ revolutionary and award-winning graphic novel won considerable acclaim for its thoroughly impressive loyalty to the source material. The director’s cut of the film adds a further twenty-three minutes to the story, bringing it ever closer to the graphic novel. For this special UniComics screening, the film will be introduced by Dave Gibbons.